Congratulations "City of God" DVD! 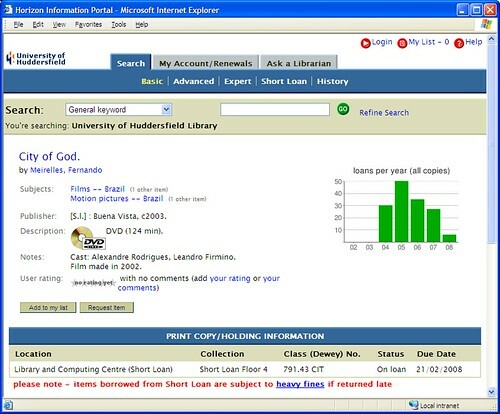 Sitting in the Short Loan collection in the main library at the University of Huddersfield, it doesn’t really stand out as been any different to the other DVDs near it, but our copy of “City of God” is officially the most borrowed item from our entire collection (which is nearly 400,000 items) in the last 3 years. 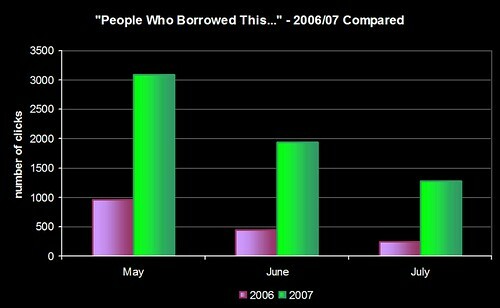 It’s not quite as popular as it once was (the number of loans in 2007 was about half of the 2005 figure), but it’s now been borrowed 157 times since it first arrived here in 2004. The most borrowed book was one of the copies of “Research methods for business students“, which has now been borrowed 118 times since it was first placed on our shelves. Author daveypPosted on February 22, 2008 Categories Horizon/HIP, Huddersfield Uni, Usage DataTags dvds, huddersfield, usagedata3 Comments on Congratulations "City of God" DVD! "Spin, spin, spin the Wheel of Justice…"
If you’ve no idea what I’m on about, then YouTube is your friend. I was struggling to remember how to find the points on the circumference of a circle until I remembered that one of the chapters in the original ZX Spectrum manual covered the topic. 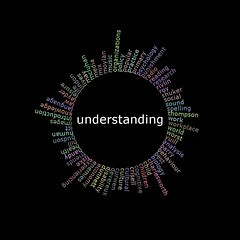 The word in the middle is chosen at random from the top 200 most popular keywords used on our OPAC and the surrounding words at those most commonly used with that word. 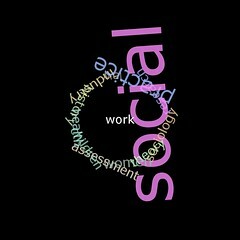 Author daveypPosted on January 8, 2008 Categories Eye Candy, Huddersfield Uni, Usage DataTags imagemagick, keywords, opacs, visualisations2 Comments on "Spin, spin, spin the Wheel of Justice…"
This is crying out to be done like the visual word map in AquaBrowser, but here’s a browseable tag cloud based on data from nearly 2 million keyword searches on our OPAC. 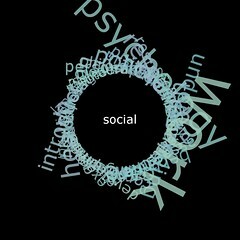 The code looks for other keywords that were entered as part of the same search (e.g. 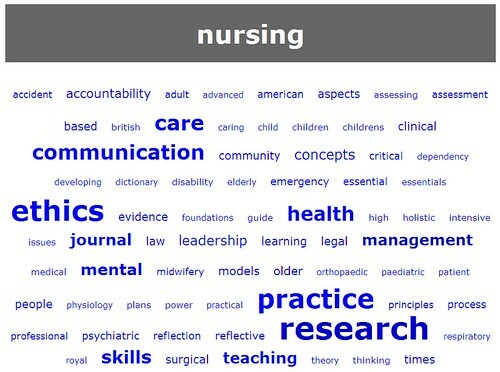 “ethics of nursing care”) to draw out the most commonly used words. 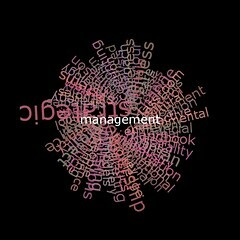 For example, the most common keyword used with “performance” is “management”. 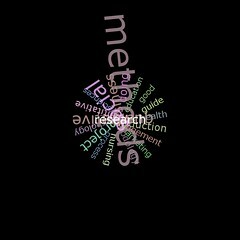 The size of the word in the cloud is determined by how often it appears with the search keyword. I’ll have to have a play to see if there’s a way of incorporating the cloud into the OPAC — for example, if you used a vague/general keyword such as “health“, then maybe the OPAC could suggest more specific searches for “health care”, “mental health” or “health promotion”? In a previous post, I mentioned that the circulation figures were up for the year so far (when compared to 2006). That got me wondering what the long term trend was for items checked out. Unfortunately there are some sizeable gaps in the historical data (as stored on Horizon), otherwise I’d be able to go back as far as 1996. The CKO data for this year is in white. There’s a marked change after 2002 in the period around May, and (if memory serves me right) the structure of our academic year changed in September 2002. The overall figures indicate that we had a slight decline around 2003, but it’s been climbing gradually since then. 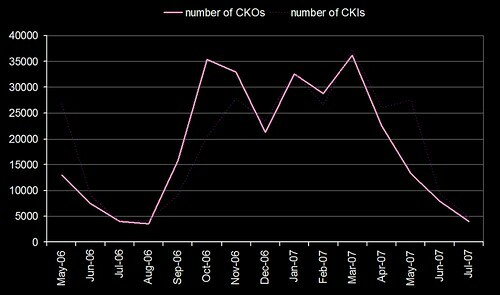 So, much as I’d love to take the glory for our increased CKOs this year, it’s probably just following the recent trend. If you build it, they'll come back for more! I’m just busy putting together slides for some of the upcoming presentations and I thought it was about time I trawled through some of the OPAC usage stats to see if our students are still using some of the OPAC tweaks we’ve made. The good news is that they are, and then some more! At first glance, nothing too surprising — the overall trend follows the academic year, with the lull over summer. 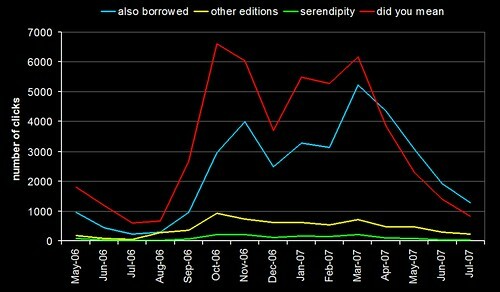 What did leap out was the blue line (clicks on “people who borrowed this, also borrowed…” suggestions) — since this April, the usage has been higher than the “did you mean” spelling suggestions (red line). So, either our users have suddenly become better spellers, or they’re making much higher usage of the borrowing suggestions. If I was a betting man, I’d say it was the latter. I’ve dug out the circulation stats for the same period and that re-inforces the statement that the students are making much higher usage of borrowing suggestions in 2007 than in 2006. You can see that the number of check outs (bold pink) pretty much matches the number of clicks on the “did you mean” spelling suggestions (red line in the first graph). 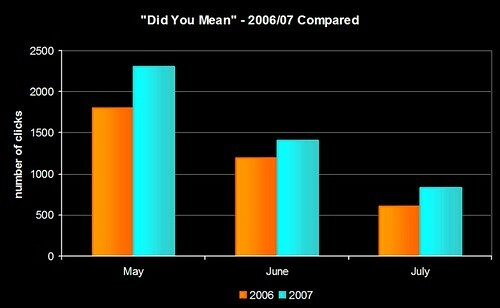 Check outs have also risen in 2007 when compared to the same months in 2006. Interestingly, I don’t think we’ve ever had a student go up to a member of staff and say “I’ve found the suggestions really useful” or “thank you for adding spell checking”. I wonder how many complaints we’d get it we turned the features off? Author daveypPosted on August 15, 2007 Categories Horizon/HIP, Huddersfield Uni, Usage DataTags huddersfield, oapcs, usagedata5 Comments on If you build it, they'll come back for more! Just for the heck of it, I’ve started logging details of the full bib pages displayed in the OPAC to get a feel for what are the most looked at books. Once we’ve got enough data, it’ll be interesting to cross reference that with the actual number of physical copies we own for each title and whether or not a copy was checked out shortly after it was looked at. 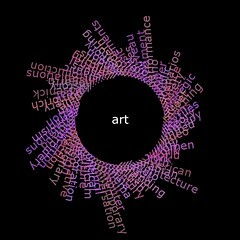 Author daveypPosted on March 19, 2007 Categories Horizon/HIP, Huddersfield Uni, Usage Data1 Comment on Hey, whatcha lookin' at? From the Newtown (CT) Bee, C.H. Booth Library is looking for opinions about the library from an unlikely source: the people who do not use it. As part of a study for long-range planning at the library, made possible through a $9,000 grant awarded in 2006 by the Connecticut State Library, consultants Kevin McCarthy, director of Perrot Library in Old Greenwich and Christine Bradley, Connecticut Library Consortium executive director, have created a survey for local residents. To date, more than 300 surveys have been returned, a return rate that Mr McCarthy said at a meeting January 9 is very good. At Huddersfield, we’ve been busy trawling our usage stats — firstly for our initial Equality Impact Assessment of opening hours, and more recently an analysis of non and low usage by staff and students. …okay, enough already – you get the idea! are certain ethnic groups more likely to use the Library outside of the standard opening hours? do we get more male or female students using the Library in the wee small hours? are students coming in to use the computers, to issue/return items, or to sit quietly in a corner and study? 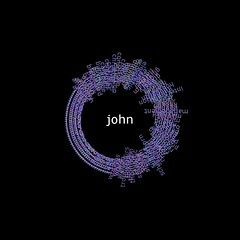 The answers to those kinds of questions tend to be found in several databases. The Sentry database tells us when someone entered the Library, but it doesn’t tell us if they are male or female, Asian or Caucasian – that kind is information is stored in the Student Records System. Also, the Sentry database doesn’t tell us what the student actually did – Circ transactions are in Horizon and PC usage info is stored in other databases. So, long term we’re looking at ways of trying to combine data from all of those sources into meaningful and enlightening stats. “What has this got to do with showing borrowing suggestions in HIP?”, I hear you ask! Well, once I’d had a hunt around in our circ_tran table in Horizon, it seemed like a great use of all that historical Circ data would be to do an Amazon-like “patrons who borrowed this book also borrowed…”. The circ_tran table contains (amongst other things) two very useful bits of information – the borrower# and the item# of the item they borrowed. You can use the item# to look up the bib# of that item (using the item table). …those bib#s that appear the most times in the big list are therefore the most appropriate ones to suggest. Unfortunately those 4 steps can take some serious CPU time, so it’s not possible to do it on the fly as each of your patrons brings up a full bib page in HIP. 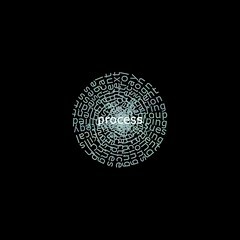 Therefore, you need to pre-process each of your bib#s to generate a list of other suggested bib#s. I wrote a Perl script this evening (which I’ll make available soon) that slurps up the entire circ_tran table into your PCs memory and then processes each of the bib#s to create up to 10 other suggested bib#s. Each of those suggestions is then pumped into a MySQL database where it will sit until a patron views that bib#s page in HIP. The only real drawback is that it’s not working with your circ_tran data in real time – the list of 10 possible suggestions per bib# won’t change until I run the slurping Perl script again to rebuild all of the suggestions. On our database of 2,046,180 circ_tran entries, that took about 3 hours to process. So, in theory, you could schedule it to run once a week or once a month.